Bend Beanies: Hats are making a comeback in Popularity! Hats are making a comeback in Popularity! window as a man wearing the ubiquitous baseball hat walks by. Going to high school wearing the hand-knitted, cranberry-color beret my grandmother gave me for my 16th birthday would have been an embarrassment. Purchased at a Methodist church bazaar and tenderly wrapped by grandmother, the beret was bright and eye-catching. But as a shy teenager who wanted to disappear in the throng of raging hormones flowing through my high school's hallways, the hat's flamboyant quality made it a no-no in the Pacific Northwest's muted Grunge Fashion. In December, as I was sifting through keepsakes, I found the beret buried in a box. It looked almost new, having languished for almost 15 years, mostly in the dark, with only a handful of outings that always ended in feelings of inhibition and self-consciousness. Images from some of the fashion magazines I recently had flipped through at the gym began flashing in my head: photographs of Rhianna, Beyonce and Cameron Diaz topped off with loose-fitting, knitted berets. In fact, berets and a host of other hats, from the fedora to the fur trapper, are the winter's hottest fashion accessories for both women and men. Walk into boutiques in Ashland and you'll find a rampage of hats, as well as a shop devoted entirely to hats called Hatsetera on East Main Street. With winter winding down, many of them are on sale. It seemed the time finally had arrived for my grandmother's gift. Not only was my beret knitted and loose-fitting, it possesses the bright and bold hues that have set the trend this season. The following day, I debuted my suddenly stylish, 15-year-old beret at the office. The warm welcome made me regret not wearing it sooner. "Cool hat," commented the easygoing copy editor from Texas. "Is that a new hat?" another colleague inquired. "Nope," I said proudly. "It was a 16th birthday gift." I was so delighted with the resurrection of my beret I packed it for a vacation earlier this month to Canada's fashion capital, Montreal. Coming from Southern Oregon, where comfort generally outweighs style, I fretted that I might look like a country bumpkin in fashion-conscious Montreal, so I took care with my ensemble. Following the fashion magazines' advice, I positioned my beret toward the back of my crown, allowing some of my long locks to hang in front, and paired it with a long necklace, a fitted black cashmere sweater dress with voluminous sleeves, stockings, black boots and a long charcoal-color metal necklace studded with tiny, clear crystals. I glided through Montreal feeling stylish in my beret. "This hat might be homespun," I thought, "but it's not humble." The bright color of my beret drew the eyes of the Quebecois passing me on the streets. It also won a compliment from my Quebecois boyfriend whom I was visiting. Montreal's downtown was a kaleidoscope of hats: Russian fur hats, fur-trapper hats, cloches, newsboy caps, pork pie hats, knitted beanie hats with cat ears and, gratifyingly, berets. My boyfriend escorted me through the frigid, snowy city wearing an en vogue black suede hybrid of a baseball cap and a fur-trapper hat. The fur-trapper has fur or faux fur-lined flaps over the ears that can be fastened up on top of the hat for a different look. It's one of this season's examples of hat styles that are popular among both men and women. In Southern Oregon, you'll find a similar array of hats, with only slightly lower wear per capita. "We sold so many hats this year," said Natalia Bishop, manager of Earthly Goods in Ashland. "It was crazy. We had to keep reordering." The fur-trapper and crocheted beret have been among the most popular, Bishop said. Alyssa Rosenthal, a sales associate at Renaissance Rose, said fedoras have been the hottest-selling accessory at the boutique on Ashland's downtown plaza. A man in a fedora is nothing new in Oregon, but this year the fedora has also become an elegant and warm addition to the female ensemble, Rosenthal said. "We sell at least one fedora a day," said Rosenthal, who was wearing a black wool newsboy cap with a buttoned bill. "I have a pin-stripe fedora, which is a little more feminine," Rosenthal said. "I wear mine all the time, usually when I dress up." The fedora also comes in a straw version this season. So why are hats so in favor? The hat obsession could reflect a collective nostalgia, said Ashland resident Kate McCabe, who collects unusual hats. "My idea is that people are very nostalgic about a simpler time," McCabe mused. Yet, there are also pragmatic reasons to favor the hat this year. Some Southern Oregonians said they wear hats for warmth or to guard against sun exposure. "I bought some hats after I had a bad haircut," said Tanya Casey, a student at Southern Oregon University who wore a black cotton newsboy with a black, brown and white plaid ribbon band and bow. The hat also has the ability of changing the look of an outfit, allowing fashionistas to do more with less in an economy that deteriorates by the day. 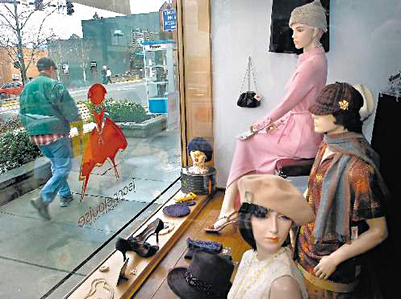 The hat itself can be altered into an entirely different look, said McCabe, who wore a camel-color wool beret with a purple-petaled flower brooch made of wool pinned on the side as she browsed through the Jeannelouise Vintage shop in Ashland. "Pins are a good way to decorate and change a hat," she said. "You can also do tucks in the hat to make different shapes. "Some of my friends thought I had bought a new hat when I added the pin to this one." Those who grew up in the tradition of the daily hat are noticing its rebound. "When I was growing up, we went nowhere without a hat," said 76-year-old Mary Sajben, of Cincinnati, Ohio, was touring Ashland last week with a friend. "I've noticed a lot more hats lately," said Sajben's friend, Joan Stouffer, of Chico, Calif., who wore a black fleece coche. "I wear this one because I can just throw it in the washer. It's so cute, and it's warm." Back at the newspaper, I noticed one of my colleagues who has worn a felt fedora to deflect the elements for as long as I've known him. "You're in fashion these days," I called out approvingly. "No," he gaffed. "Fashion has caught up to me." I smiled, grateful that fashion had also caught up with my cranberry-color beret. Reach reporter Paris Achen at 541-776-4459 or pachen@mailtribune.com. Bend Beanies is a Crochet Blog where we can discuss crochet, knitting & fiber arts. We will also offer Free Patterns. Our Bend Beanies Etsy Shop offers crochet items for sale, handmade by a mother-daughter team in Bend, Oregon. We would like to network with other crafty people! Would You like to link here? Please send me your link!